WMU faculty are paid less than our colleagues at nearly every one of the schools that WMU identifies as a “peer” institution. WMU faculty salaries rank dead last among the eleven peers for assistant professors. Full professors and associate professors rank eighth and ninth, respectively, out of eleven. WMU has been designated a “top 100 national university” by the Washington Monthly. WMU ranks 342nd nationally for faculty salaries at public universities, according to the Chronicle of Higher Education. Faculty salaries at WMU are among the lowest in the state, even compared to Central Michigan, Ferris State, Oakland, Eastern Michigan, and Grand Valley – none of which share WMU’s Carnegie Foundation classification of Research University – High Activity. WMU President John Dunn now ranks 18th for presidential compensation at public universities in the United States, up from 88th place last year. He was paid more than $776,000 for the last fiscal year, which includes a substantial deferred-compensation payout. In the previous year, he was paid over $471,000, which is $30,000 above the national median of $441,000 and which ostensibly did not include a substantial deferred compensation payout. The average annual increase to the university for healthcare costs incurred on behalf of WMU-AAUP faculty is 4.3 percent. 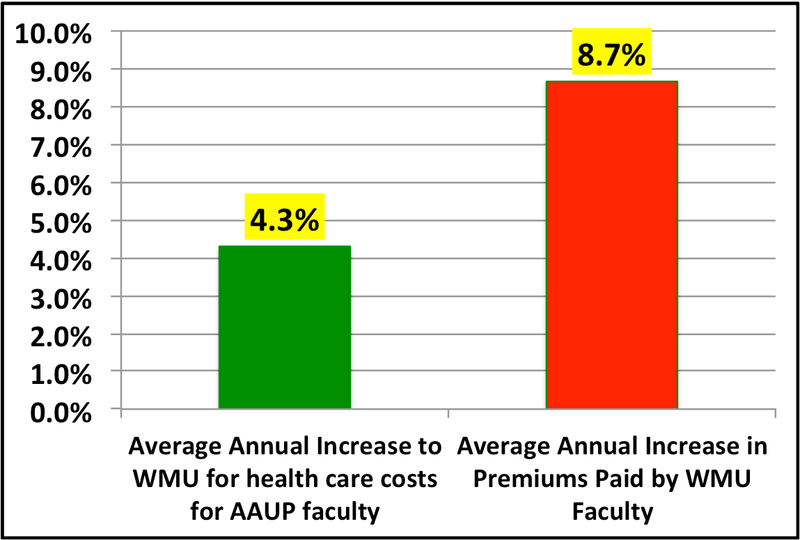 The average annual increase in premium costs passed on to WMU-AAUP faculty is 8.7 percent. Faculty at WMU already pay more for healthcare than our colleagues at nearly every other institution in the region. The administration’s current proposal would shift more of the total cost to faculty. This would cost faculty members hundreds to thousands of dollars more over the course of the next contract. Our negotiation team, the chapter leadership, and the WMU-AAUP Executive Committee are united in our dissatisfaction with the state of affairs described in these data, and what we are hearing from our faculty colleagues is that you are not OK with it either. Please help support our team by turning out today for the chapter meeting. It is time to make sure the administration knows how you feel and time for all of us to bring the strength of our numbers to this negotiation. Our 2011-14 contract will expire approximately 15 hours from now. Our team is fully prepared to keep negotiating even after the deadline if that is what it takes. But we need you to show them that you have their backs. We need you to help us take advantage of — and add to — the pressure that is already on the administration to get this done on time. The time has come. See you at 1:30, 105-107 Bernhard Center. This entry was posted in Uncategorized by lcm. Bookmark the permalink.